I love a good kitchen makeover as much as the next Pinterest-addicted gal, but sometimes one stands out above the rest, and this is one of those times. I can’t stop loving Kristi’s new cabinet makeover and ledge shelf over at I Should Be Mopping the Floor. It could have something to do with the fact that it reminds me of my own kitchen range and shelf (which she says was her inspiration for the idea), but I think it’s mainly because it’s just plain awesome. This is the before. 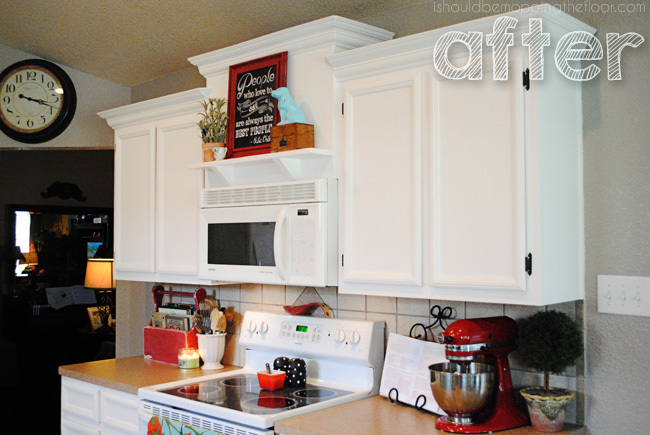 She literally transformed her builder-grade cabinets into a custom look with varied height and a shelf ledge! Not to mention the paint job. And she did it all herself! I love it! It’s gonna be so fun for her to decorate for theseasons! And she gives her step-by-step tutorial so you can do it, too.Click over to read all the details on how she did it so you can pin it for when you need it later. Thanks, Kristi, for allowing me to inspire you so that you can inspire usand we can all inspire someone else. And now that I’m singing,”You’re the meaning in my life, You’re the inspiration…”, I’m off to pin this and spread a little hope to someone dreaming of a better kitchen. Have you done your own version of a project you’ve seen here at the blog? I’d love to hear about it! Send me your pics! This entry was posted in Uncategorized and tagged Inspiration, Kitchen Renovations, Reader's Spotlight. Bookmark the permalink. Follow any comments here with the RSS feed for this post. Post a comment or leave a trackback: Trackback URL.